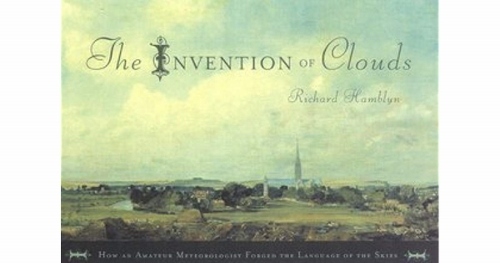 Naming things is a powerful activity—it was man’s first task in Genesis—and this power is explored in Richard Hamblyn’s brilliant book The Invention of Clouds: How an Amateur Meteorologist Forged the Language of the Skies. I do not think I have ever read such a satisfying, lyrical, information-packed science history book before, although I have read many good ones. A favorite pastime in the early 1800s was attending scientific lectures. Quakers were not allowed to attend universities, but because they could attend these lectures and even give them, they became a force to be reckoned with in the British scientific world. One of these Quakers, Luke Howard, gave a lecture in 1802, grouping clouds into categories: cirrus, cumulous, stratus, and nimbus. This talk, later expanded into an essay, spread like wildfire through Europe, greatly influencing both science and art and becoming the basis for modern meteorology. Hamblyn tracks this development and its many aspects, from the growth of scientific journals to the increased fascination with meteorology throughout British and European society. We bump into one famous name after another: Napoleon, Jane Austen, Coleridge, Charles Darwin, Beaufort (of the Beaufort wind scale), Davy the scientist, Shelley, Keats, and many more. Goethe became a strong admirer of Luke Howard and even wrote poetry based on his cloud classifications, later adding verses celebrating Howard himself. Constable’s cloud studies were solidly based on the new developments in meteorology. One could almost say that, once there were words to categorize clouds, cloud mania enveloped Europe. The profound humility and eagerness to serve in this last statement should make many of us pause. Are we so eager to serve God? Are we so humble and busy for him? In portraying Luke Howard and his society to us, Richard Hamblyn, perhaps unwittingly, gives us insight into a deeply Christian way of looking at the world and at human activity as well as insight into the beginnings of meteorology. He does it all with consummate skill, weaving all sorts of ideas together coherently and beautifully. All in all, The Invention of Clouds is one of the best science history books I have read. This is the kind of book that could be used as science and math reading for high school. It could also be used for history or even for an extensive unit study, given the many possible rabbit trails it introduces. To really enjoy the book readers should know a bit about European history and culture at the time and regularly be able to take a few moments regularly to watch clouds. Posted in: 52 Books in 52 Weeks, God's Wonderful World, Quotations, Reviews, Reviews: Nonfiction. You are welcome, Carol! I think you and your daughter will enjoy this book. It covers so much in such an interesting way. I do not get the feeling that the author is Christian but Luke Howard, the subject of the book, certainly is and the author lets that shine through. As I recall, he also quoted a bit of Maxwell’s verse mocking the nonsense of the new idea of evolution, but I can’t write it out for you as I had to return the book to the library. Yes, they say evolution is often a real stumbling block to faith. I suppose that is one reason it is pushed so hard by militant atheists. I am so thankful it was not a problem for you! May God bless your conversations about ‘The Short History of Nearly Everything’ and all the rest of your homeschooling as well.